Gardening is a great way to learn patience. Or so I’m told. I’m still a bit impatient. Some days there is a lot of hurry up and wait. Crops and animals grow slowly. Soil improves over long periods. Like parenting, life on the farm is sometimes comprised of long days and short years. But it teaches one to plan ahead and that some things are simply out of your control. We wait for the means and time to complete projects. We wait for the crops to grow. We wait for the weather to change. And we work while we wait. Our friends who are new to farming, of whatever scale, are always so gung-ho. They believe that they can get their farm “set up” in all its bucolic glory and then settle into a routine of planting and harvest. Wouldn’t that be lovely? I have never seen that happen. The only bio-diverse farms (of which I am aware) that hum along without projects constantly in queue are very well established and have already seen decades of work. These friends, who will work around the clock the first year or two without any rest, risk burning out and often face disappointment. I know because we did it. But now we are starting to let go of the frustration. A farm is never done. It is a living, fluid, maturing, and literally breathing organism, subject to fickle and forceful nature. Sometimes you need to have a drink and watch the sunset. Sometimes you need to stop the truck and chat with the neighbor. There is always a list. There is always a repair or improvement. We’ve learned there is a time to work and a time to rest because if you put off the rest until it is all done, you’ll die without ever having taken a break. So we rush the things that cannot wait and we wait on the things we cannot rush. And we take a breather. We look out over the land and we suppress the anxiety and choose to be thankful. We choose to work until we can’t (or shouldn’t) and then we rely on the trust that whatever the outcome, whatever the harvest, we will wake up and work another day so we can wait on the fruits of our labor once more. This is a good summary of soil biology. This entry was posted in education, farming, food, gardening, Health, homesteading, organic, permaculture, self improvement and tagged Choices, farming, Gardening, growing, homesteading, organic, permaculture, rest, sustainable, vegetables, waiting. Bookmark the permalink. 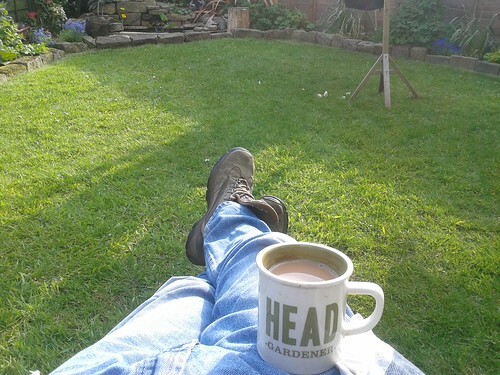 There are 3 very definite things I have learned while gardening. 1. You are not, in any way shape or form, in charge here. Nature is and all you can do is ride the crest with the things you plant. 2. Patience is not a virtue, its a necessity. 3. Experience talks… And you should damn well listen when you hear it. Yep–music, beach, fellowship, and more . . . we gotta leave some time for those, ‘cuz the weeds continue to grow!